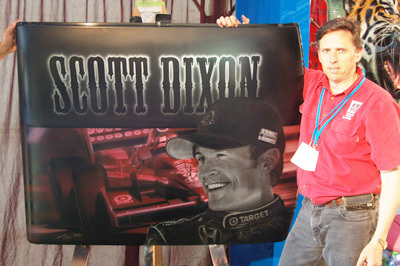 As airbrush teachers, it is an amazing feeling to be able to teach anyone to create artworks like this one of Scott Dixon. It can be hard to accept that people with no art or drawing experience can learn to do this, but the Venturi System makes learning to airbrush possible for anyone willing to put the effort into their training. As a training organisation Airbrush Venturi is very unusual; unlike any other in Australia or New Zealand . . . anywhere in the world for that matter. The differences are important. • Airbrush Venturi does not do commercial airbrushing. • Airbrush Venturi does not sell equipment or materials. • Airbrush Venturi does one thing only and we do it very well . . . This is not to say that our teachers do not independently do commercial airbrush projects; they do. They bring this real world experience and knowledge to their role in Airbrush Venturi, and it adds an important dimension to their ability to teach for us. In fact with so many teachers, we have a vast body of accumulated experience in almost every application of airbrushing. No matter what you wish to do with the airbrush, we have a teacher with specialist knowledge in your field. Central to everything we do is the Venturi System. This is a system of rendering with an airbrush to create realism. This system makes every part of the process of airbrushing measurable and systematic. The word “rendering” is the key word here. We don’t teach “art” or “creativity” . . . these are meaningless words. People want to learn to make sense of the thousands of choices they can make when they hold an airbrush, they want structure . . . and for the courses they do to be based on proven logic from decades of research. 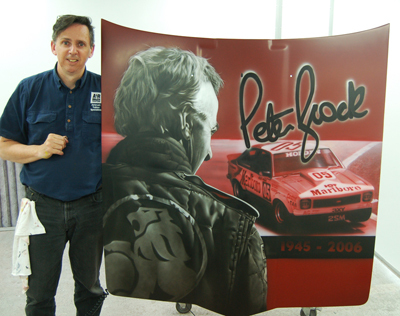 This commemorative artwork of Peter Brock airbrushed by Tony Vowles was created to raise money for CanTeen. It raised $3300.00 at the WA Hot Rod Show in 2011. Although Tony has done extensive commercial airbrushing in the past, these days he primarily airbrushes for charity. In 2011 he raised just under $20,000 for CanTeen and The Princess Margaret Hospital. This is a story about the power of ideas. Airbrush Venturi started out as an “idea”; an idea that a program of systematic research was needed, into the methods and materials of airbrushing and to develop powerful step-by-step processes that would enable airbrushing to be competitive in the Computer Age. The year was 1986, over 25 years ago. The research was begun by Tony Vowles. He came from a family of engineers and simply applied the processes of engineering to the field of airbrush methods and material technology. Tony says “In the early 1980′s I was employed as a sales rep. for a major art materials supplier, being paid to visit commercial illustrators, animators, photo retouchers, signwriters, and also all the tafe and tertiary colleges. It was a pivotal experience for me. It was amazing in two completely different ways. Firstly I got to meet some of the most incredibly skilled airbrush artisans that Australia will ever know and secondly, I witnessed every tafe and tertiary college in the state remove the teaching of airbrushing from all their courses slowly over a ten year period . . . I watched the future of airbrushing be dismantled. 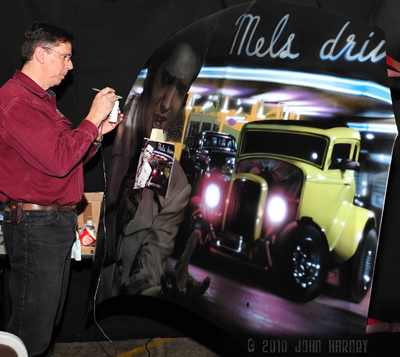 This artwork of Elvis and a collage of scenes from the movie American Graffiti raised $3500.00 for a specific young girl with Cerebral Pasly, again with the direct support of the WA Hot Rod Show and number of important people in 2010. From signwriting, visual merchandising, painting and decorating, industrial design, architectural design, illustration, finished art, animation, from everything! I couldn’t believe that an art tool as amazing as the airbrush could just be completely abandoned by the education system. But when you look back at the techniques they were teaching; traditional cut stencil techniques, I am not surprised. One of my hobbies is “history”, especially the history of the airbrush. It turns out that there has been almost no systematic research done into the techniques of airbrushing. All the courses were created by employing professional airbrush users who had developed their skills by simple trial and error. I like things to be logical and systematic. I was convinced that airbrushing could be developed into a systematic process. I have a real passion for classical music; it is engineered music. I was convinced that if it could be done for music, then it could definitely be done for airbrushing. 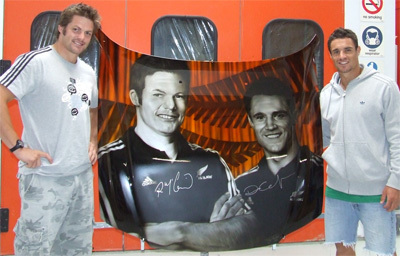 This artwork of the two most famous Rugby players in the world at present, Ritchie McCaw and Dan Carter, by Tony, was airbrushed to raise money for CanTeen in Christchurch. With the support of the Rangiora Car Show, SIT and by Dan and Ritchie, they were able to raise $4,000. • Fast forward 25 years and we have developed several “languages” for airbrushing (think the visual arts equivalent to written music) that have enabled us to quantify and study airbrushing. In turn this has led to the systems we are renown for, that people come from all over the world to learn. This journey of discover and research never seems to end. There is always new knowledge to learn and develop. We have students that come back every five years or so, just for a “software upgrade”. We set out to create a new future for airbrushing and I think that our research has been the seed that was needed to enable airbrushing to grow to what it is today in our country. Anyone can become a teacher of Airbrush Venturi. But . . . it takes between 450 hours of airbrush training, 80-150 of training as an assistant and another 80-150 hours as a trainee teacher. 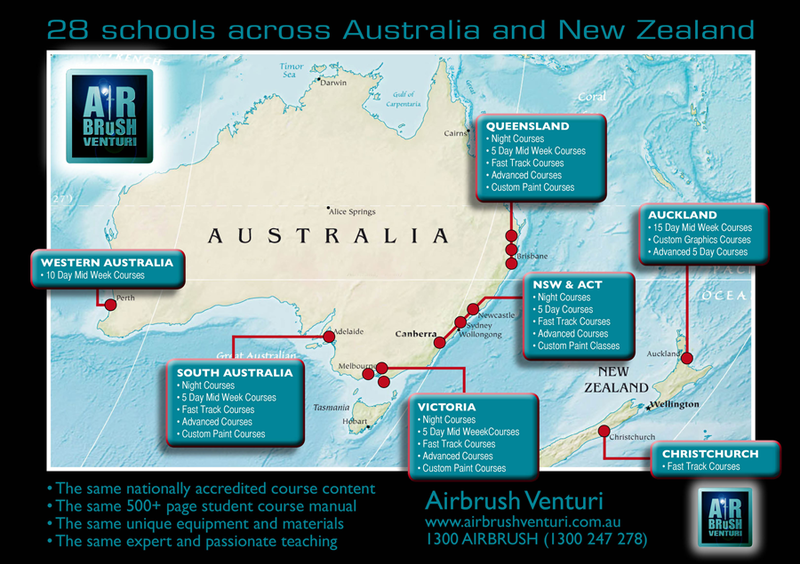 At the end of roughly 750 hours of training a person becomes an accredited Airbrush Venturi teacher. This is a huge task and it is evidence of the enormous passion and commitment of the Airbrush Venturi teachers, to be the best possible teacher that they can be. Airbrush Venturi operates as a “collective” of airbrush schools that all teach the Venturi System under license. This means that everyone owns and operates their own school (read – they operate their school with a deep passion and commitment to airbrushing) but they all teach an identical system and cross support and promote each other . . . they work together to create a national standard for airbrush teaching. Every year more and more people join the network. This means that access to the Venturi System gets easier and easier for more and more people. Again we will let our founder tell the story. “One of the most amazing experiences of my life has been the support and passion that people have for the teaching systems that I developed. I am honoured to have people from across Australia, New Zealand and the US that are sharing my systems, and their passion for airbrushing with their local communities, something that I could never have done without them; I can’t be everywhere. And they are doing it in the best way possible. When people enrol with any Airbrush Venturi school they are joining a community of airbrush teachers that are unique . . . they work by consensus. This is very powerful. Every one of these teachers is my harshest critic. Every new development, every new page of notes that I create, has to pass the Airbrush Venturi Teacher test. When I have the approval of my network of teachers, then we can take it to the local community. They know that they share the same knowledge as everyone in their community, and that “talent” doesn’t come into it. The difference is that every person has a unique interpretation of this knowledge. The difference is subtle but very powerful. We teach our students to “see with knowing eyes” . . . to be able to see into any photo, any artwork, or effect and to see how to construct it. Our students don’t need to learn “recipes”. They know that all they have to do is follow the systems they are taught and they can create anything. It means that they have a confidence about their potential, they are not questioning whether they have the “talent” to create great artworks. They know they will be able to if they put the time and practice into the techniques they have been taught.